Rinse your kelp noodles in warm water. Cut them into small pieces (around 5 cm/2″ long) with scissors, and put them in a large mixing bowl. Grate the carrots however it pleases you: by hand, in a food processor with an S-blade, or with the grating attachment. Pop them in the bowl with the noodles. Tear the kale into tiny pieces, and massage it with 1 tbsp olive oil and a pinch of salt. Rub the salt and oil in until you can feel the texture of the kale change in your hands and go soft, this makes it more digestible. Add the kale to the carrots and noodles. Add in the sauerkraut, and bean sprouts and give it all a good mix together with a spatula or large spoon. Then add the dressing: the sesame oil, rice vinegar, coconut nectar, tamari, ginger and cayenne. If you don’t have sesame oil, hemp oil works just as well. I use Clearspring rice vinegar and tamari. Keep mixing well until you’re satisfied it’s all combined. Next, take your first wrap, and a cup of your noodle mixture. Put the mixture in the centre of the wrap, and spread it in a strip across the middle, as if you were making sushi. Roll it tightly, pass it to one side, and repeat three more times. This should use all the noodle mixture: if you have any left, you can make a mini spring roll, or eat it as is. Serve the rolls whole, cut into halves, or cut into quarters, depending on the occasion you’re preparing them for. 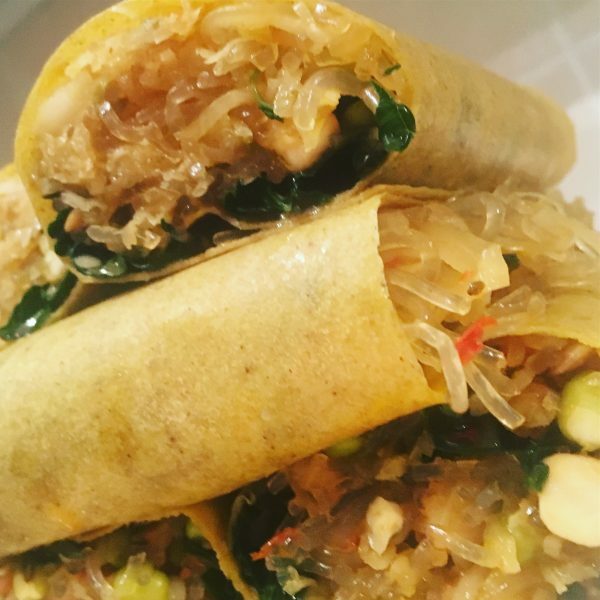 These are one of the many raw recipes that taste even better when they are a day old: the flavours have mingled and the oil has made the wrapper a little greasy, just like they come from the Chinese take-away.